Pennine Community Power’s wind turbine in Blackshaw Head has produced enough electricity to power more than 25 homes for a year. The turbine has produced 100,000kWh of electricity since it was installed four years ago, passing a generation milestone. The community benefit society, Pennine Community Power (PCP), installed the turbine with a grant from Village SOS, part of the Big Lottery Fund, and investment by 66 local residents in the upper valley. Louise Marix Evans, Chair of PCP said: “We are delighted to have reached this milestone. 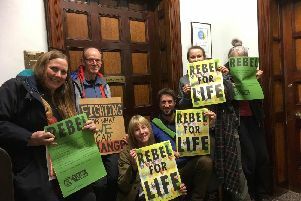 “The turbine has generated more than forecast, earning income from the feed-in-tariff sufficient to pay for the investment and to contribute to our fund with the Community Fund for Calderdale. “Grants worth over £4,000 have been made to the community for environmental projects and the Hebden Bridge flood relief fund. With the success of this renewable energy scheme, the Pennine Community Power have started working on other projects within the community. Louise said: “Our latest project, a solar PV installation at Colden School, has just been completed and will do more. The PCP’s Community Fund has to date given away £2,800 to local projects, including £1,400 to the Community Foundation for Calderdale Flood Relief Fund. A public meeting will be held by Pennine Community Power on November 17 at Hebden Bridge Town Hall to discuss community owned electricity grids from 8.30pm to 9.30pm.